Perhaps the armory is a further indication. I had the impression that French cavalry normally had no cuirasses. Therefor the cuirassiers are rated standard because this was the only regiment which always had the cuirasse. I don't think that the Cuirassiers du Roi really performed better (that means I don't have a source which mentions that), but perhaps the cuirasses served well. Schomberg-dragoons are not authentic for the WAS, you know. Abandon them immediately! I would rate them just large. That gives a +1 modifier for large units. Yes, I don't think also that Cuirassiers du Roi performed better, really not such evidence. I promise to read your post about the French army again, carefully and reply! Cheers! Oh, I forgot your picture in your profile. 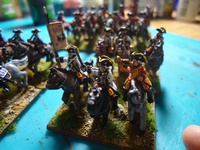 Than forget, what I said about Schomberg dragoons! They should be Standard because they have the spirit of the maréchal de Saxe in their veines.